WWF and the AEF (Aviation Environment Federation) disagree with the CAA arguments of needing more airport capacity in the south-east. A recent WWF report shows that there is enough capacity in the south-east and other regions to meet demand, in line with the recommended limits on aviation growth laid down by the Committee on Climate Change (CCC) to ensure the sector plays a role in limiting its carbon emissions. Presuming larger planes in coming decades, for increased efficiency per passenger, it is likely that there would only be perhaps a 1% shortfall in capacity by 2050. WWF says the CAA and others pressing for more airport capacity should take proper account of the climate implications of their plans. They are just the latest in aviation industry ‘groupthink’ that new runways will magically lift us out of recession. They will not. WWF and the Aviation Environment Federation (AEF) have rejected a new report from the Civil Aviation Authority (CAA) that claims new runways are needed in the south-east to meet consumer demand. (CAA story). The CAA’s report ignores the advice of the government’s climate advisers, and directly contradicts government policy about making the most of the airport capacity we already have. According to WWF and AEF’s recent assessment of UK airport capacity, there is already sufficient capacity in the south-east and other regions to meet future demand, in line with the recommended limits on aviation growth laid down by the Committee on Climate Change (CCC) to ensure the sector plays a role in limiting its carbon emissions. Our analysis shows that a small shortfall in capacity is expected in the south-east, but not enough to require a new runway or airport, especially given the trend towards larger aircraft. Using BAA forecasts at the Heathrow Terminal 5 inquiry, which show average passenger numbers per aircraft increasing from 143 to 198 over time – and assuming other south-east airports also reflect the trend towards higher passenger loading, albeit to a lesser extent – WWF and AEF concluded that the shortfall in Air Traffic Movements (ATMs) in the south-east by 2050 would be tiny: less than 1%. Our transport policy expert Jean Leston says: “This report is just the latest in aviation industry ‘groupthink’ that new runways will magically lift us out of recession. It’s time they came back down to earth and thought about the climate impacts of what they’re saying. The AEF / WWF report is at “Available UK airport capacity under a 2050 CO2 target for the aviation sector” (July 2011) 20 pages. In the UK, transport accounts for around 28% of our total emissions of carbon dioxide, the main greenhouse gas causing climate change. Living within the limits of a single planet will therefore require changes in the way we currently move ourselves and our goods around the world. WWF’s One Planet Transport campaign is focused on finding solutions that will help reduce the need for travel and encourage a shift to more sustainable ways of making those journeys that are necessary. It is already responsible for around 13% of the UK’s overall climate change impact. It is one of the fastest-growing sources of carbon emissions in the UK. At current rates of growth, by 2050 aviation emissions will account for half the UK’s carbon budget. The UK is committed to an 80% cut in CO2 emissions by 2050 – if aviation emissions continue grow unabated, aviation will consume the majority of this carbon budget. Swallowing up our limited carbon budget in this way, could potentially push up the cost of living for everyone – including half of the UK population who don’t fly in any given year. WWF’s One in Five Challenge aims to galvanise the growing desire among businesses to fly less by providing a focus for flight reduction. Business flying plays an essential part in determining aviation’s future – it currently represents 25% of UK passenger trips and a much higher percentage of airline profitability. Our research challenges the assumption that airport expansion is essential for business productivity, and lends support to WWF-UK’s campaign for companies to cut one in five business flights. This film explores report and One in Five challenge. Aviation is one of the fastest-growing sources of carbon emissions in the UK, rising annually at a rate of 3% and representing 13% of the climate change damage generated by the UK. 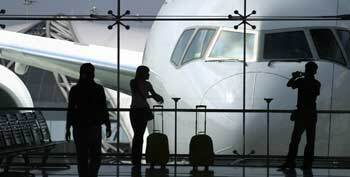 Business flying represents 25% of UK passenger trips and a much higher percentage of airline profitability. WWF-UK sought to understand how seriously businesses are taking the need to reduce their carbon footprint from travel, and their future flying intentions. 62% of companies surveyed are already reducing their business travel footprint. A further 24% of companies are currently developing plans to do so. 89% of companies expect they will want to fly less over the next 10 years. 85% of companies say that videoconferencing can help them reduce their flying. 89% of companies believe that videoconferencing can improve their productivity. These findings are very significant, not only because they challenge the assumption that airport expansion is essential for business productivity, but also because they lend support to WWF-UK’s latest campaign calling on companies to cut one in five business flights.